GREAT NEWS! We received word yesterday (June 21) that our application for a Community Development Block Grant has been approved. That adds $250,000 to our building fund. Now we are waiting on word from the Neighborhood Assistance Program (NAP). That grant application is for $500,000. Those two grants along with money we already had in our building fund would give us $800,000 to work with. While that is a tremendous amount, it may not cover the entire cost of the building. We must continue to raise money to make sure we succeed. With that in mind, we started a new raffle for this summer and we are planning other events for the rest of the year. Aside from the cost of prizes, every penny earned goes into the building fund. 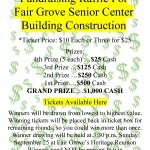 In past years we have raffled off various items. Those items have not appealed to everyone, so this summer the raffle will consist of cash prizes. Winners can spend that prize money anyway they want. The grand prize in our raffle is $1,000. As with the gun raffles we held the last two years, winning tickets will be placed back in the ticket box for the next drawing round, so you could win more than once. Click on the photo below for details about raffle.